Well, first of all, we are excited that our Brazilian friends have returned from furlough, but I don't have any photos of them recently. it wasn't eloping in the strict sense. Anyway, I had a nice visit with them when I had them over for supper while everyone else was still away on outreach. They shared their wedding photos with me so I am posting one of theirs and a photo of them at my place that evening. So this is the second cross-cultural marriage on our team this year. First American Silas married Romanian Mihaela and now Indonesian Butje has married Moldovan Liuba. I had hoped to match Liuba up with my son, but Butje was just too fast! :-) Anyway, congratulations, dear friends! 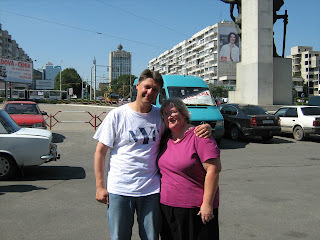 Third cause for rejoicing is that my dear friend Jurek finally came for a visit, even though it was way too brief. Posted by Barb at 5:49 p.m.